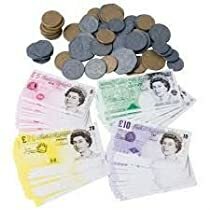 A set of plastic pretend coins and paper notes for playing pretend shops and shopping. Also a great teaching aid. Recommended for 3 years plus.